On the 2nd, 3rd & 4th October 2015 I was in Manchester for the PHP North West Conference 2015 where I did an ElasticSearch presentation. I have been attending this conference since 2010 and this was my 4th edition as a speaker. I personally love this conference and I have a great deal of respect for Jeremy Coates, the organizer of the event. Another thing I have to admit: the UK is my favorite audience. This was my 15th talk in the UK and the crowd has always been fantastic: very engaging, polite, funny. You name it. Needless to say that I was really excited to speak at the 2015 edition of PHP North West Conference. 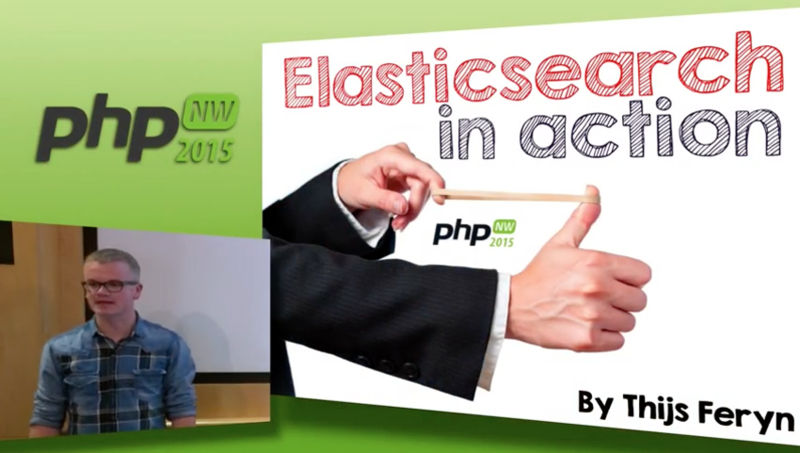 My ElasticSearch In Action talk was selected for the occasion. The talk was originally designed for the Future Of Web Apps conference in London the week after. But luckily I already had a few occasions to practice the talk. The premise of the presentation is to explain what you can do with ElasticSearch rather than spending 50 minutes explaining what ElasticSearch is and how it is composed. People like action-packed presentations and that’s exactly what I gave them. The rest of the talk consisted of hands-on examples of things you can actually do with ElasticSearch. Curious to see the full presentation? Here’s the video footage. I did a fairly long intro, but that’s a crowd pleasing thing. Unfortunately I ran out of time, which is a rare thing for me. But none the less the audience enjoyed the show and the Joind.in feedback was very positive. I like the fact that the video production team did a split-screen where both my slides and my delivery on stage were visible. I also embedded the slides in case you want to browse through the slides at your own pace.